We are Pickering’s trusted locksmith. 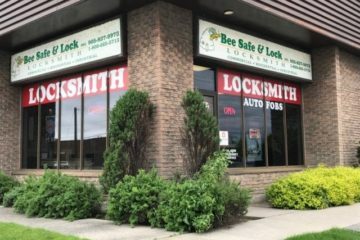 When you are looking for a locksmith with the experience and proven track record that you can trust, turn to Bee Safe & Lock Inc. We have been providing an array of 24/7 locksmith maintenance and repair services for residential and commercial clients in Pickering for over 25 years. We also offer quick and responsive mobile services for home and business owners, from re-keying and key cutting, to lock and safe installation and much more. Visit our showroom for a large variety of locks, safes, fobs, commercial locks and other forms of security hardware. Bee Safe & Lock Inc. provides commercial business and offices in Pickering with a multitude of services to keep your business secure and safe. 24-hour emergency service is also available for when the need arises. We live and work in Pickering and take pride in making sure our fellow neighbours feel safe in their homes. Our locksmiths are proficient in all aspects when it comes to your residential needs including sales, service, installation, and repair. “After having my purse taken at work with my keys inside I needed my lock changed ASAP. Bee safe arrived promptly and replaced my lock. As well, the tech spent extra time making sure the door and lock closed properly as the previous lock hadn’t been installed properly.I was wary of calling just any service as I was aware of the dish there so I wanted someone local to Pickering and who had been in business for a while. I am happy to say that Bee safe was the right choice for me.